Seems we are on a roll over here this week! We have another feature to share with you for Megan and Jeremy's gorgeous Positano, Italy destination wedding. 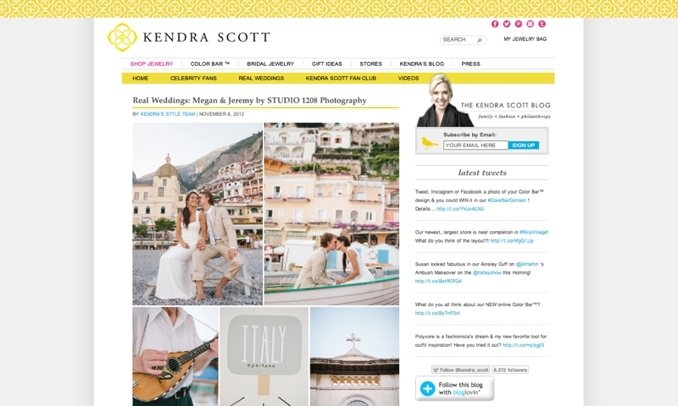 This time, it is jewelry designer, Kendra Scott sharing our images! Megan wore Kendra Scott's designs and also gifted her bridesmaids with Kendra Scott jewelry too! Click here to see the nice write up on her blog! Thank you so much to Kendra Scott, and also, to Lauren at Kendra Scott Jewelry for featuring us!